Teresa struggled enormously with her dichotomous life, that is, with her desire for the Beloved on the one hand and her enjoyment of life's pleasures on the other. Teresa was not naive, however, and she was perfectly aware that the Beloved works in and through the world. It was the attachment to the ways of the world that concerned her, the desire for her senses to be satiated through the pleasures of personal attention and recognition. It was the subtlety of her pride and ego that she watched as they would rise again and again to receive praise and acknowledgment. Even though she was ostensibly doing the Beloved's work, she knew that she was erroneously claiming the credit. Teresa instinctively knew that there was a greater purity to be had in living in this world, that there was a truth beyond personal and societal desires. In many Eastern traditions the ego and the world are understood as illusions; the reality is spirit, and all else is not real. Sometimes this philosophy can appear somewhat harsh, since it seems to dismiss as not real many of our painful earthly experiences. To me this speaks of separation -- separating our ego-selves from our divine selves. But the ego is as much the Beloved as spirit is. To say that the ego is not divine implies that it comes from elsewhere -- but from where? All is the Beloved. If we try to deny the ego, it will only fight harder to survive. And if we look underneath all the desires and claims of the ego, we always come to the same conclusion: the ego is looking to be loved. Teresa was known for her compassion and was always readily available to console and counsel any nuns, priests, or people in the community who were having difficulties. "Love one another," she would say. It is love that allows the ego to lie down calmly and to trust in the spirit of the Beloved working in our lives; it is love that shows us that the stories of the ego are not as enticing as we first thought. When our ego rears its head with its demands, ideas, and get-rich schemes, we would do well first to send it love, and then to send it more love. When it is calm, check back in. Very often we will find that its impulsive ideas have completely dissolved. Sometimes this admonition to love, and especially to love others and their ideas, can seem overly demanding. Our reaction can be to run, since nobody enjoys being commanded to do anything, but is this not what many of the great prophets and spiritual figures have taught us? Yes, we are commanded to love. Assuring someone that she is loved allows her to return to the truth of her existence. This assurance can be given through a simple gesture or tender word. Truth without love can be harsh. Love without truth can fall into sentimentality. Together they work miracles, since they relate to our wholeness: our ego and our spirit. Letting yourself sink into a place of deep peace, breathe into the largeness of your spirit. Let yourself soak in the magnificent love that you are. Now invite your ego to join you, and allow it to be enveloped in this love. Hold the ego as you would a small child, and simply allow the love to permeate, no matter what arises. Just allow the love to flow. 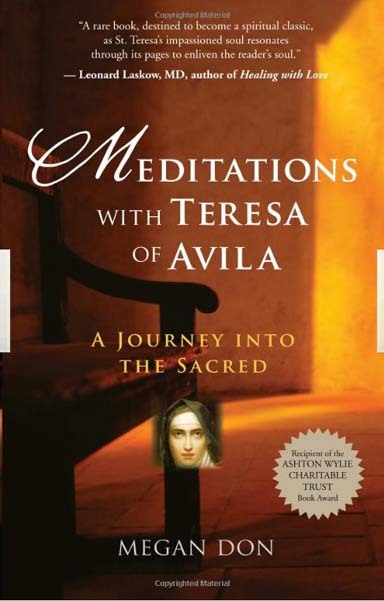 To order Meditations with Teresa of Avila from Amazon.com, click here! Our society is fraught with conflict, be it political, religious or personal. It might even be said that we, as a human race, thrive on conflict, as it seems to be a precursor to our growth and change. It provides a stimulus for disintegration of old thoughts and ways of being and regeneration for new modalities and paradigms. From the rebel teenager, to the warring couple, to international peacekeeping efforts or the political terrorist, their aim is the same -- to overthrow, or keep at bay, what they perceive as a hindering force to their right to freedom (whatever that may be). But what is the real freedom we all seek? And can we not find another more peaceful method of change? Teresa of Avila (1515-1582), Spanish mystic and Carmelite nun, was very familiar with conflict. From a young age Teresa experienced a dichotomous inner relationship with herself. She developed a deep respect for the spiritual life through her father's influence, but she also cultivated a great taste for the materialistic life through the nobility of her mother. She was ultimately split into two different modes of being and was unable to reconcile these two influences until late in her life, even while living in the monastery. Conflict became as a personal paradigm for Teresa. She was incredibly strong-willed and began the battle with her own ego, which she clearly perceived as constantly rallying against the greater will of God. This caused her much internal pain and a sense of division, as she was unable to surrender her own thoughts and will. In her resistance, she felt the ego struggling to remain in control, and yet, she distinctly felt the pull of her inner spirit. This spirit was inviting her to another place -- the place of freedom and peace. Separation from God was the cause of Teresa's conflict, and only when she was able to join her soul with the divine spirit did she find peace. It was through surrendering the ego, not annihilating it, that enabled this to occur. It was not an immediate release however, but a gradual remembering and relearning by her soul. As with Teresa, I believe that the paradigm of conflict is paramount in our society. The ego has been living a life of separation from the spirit, causing conflict to occur. On a personal developmental level change frequently occurs after a great inner tension and conflict has been felt and lived. On a political level that same tension and conflict causes a change in leadership and power, but unfortunately is often manifested and affected through violence and war. This framework and partnership of change and conflict now needs to be dismantled. This regenerative process of change can be affected in a loving way. The great beauty about Jesus was that he brought the message of truth and love. Truth without love is harsh. Love without truth can become sentimental. The two together can bring about long-lasting and effective change, both in a personal and societal context. The truth can revolutionize the way we love and the way we love can revolutionize the way we live. Acting in a loving and compassionate way was very important to Teresa and became the foundation for the success of her communal monasteries. Let us take this same concern into our workplace, into our homes, and into any situation that requires a breaking down of the old ways. Above all, let us be kind to one another and our selves. If we can affect a gentle process of change internally, then we can also manifest this in our external environment. Teresa's lifelong quest, though lived over four centuries ago, is still an example and inspiration for us to follow today. We can carry placards in the street demanding peace not war, but of what use is that if we are still warring within our own selves. We each have the responsibility to look deeply within and to be honest about the state of our own being. We each need to see how we are in conflict with the natural state of our soul. We need to look and see where we are split in our lives. Where we find conflict in our lives let us look deeply for the origin, and surrender it to God. Where we find places of unrest and lack of peace, let us surrender this too. In turning to our interior life we can lovingly heal any splits that may have occurred throughout our lifetime. We can release ourselves from the dichotomous relationship that so many of us have become accustomed to. The definition then, of real freedom is inner peace, known through acceptance and surrender. And the way of truth and love is the way of change. Like Teresa, we can become examples of what it means to live a wholesome life, surrendered to the divine will, and living in peace on this planet.